The Jazz Couriers were formed in April 1957 and played their last date on August 30th, 1959 in City Hall, Cork, Eire. In the intervening two and a half years they became the most successful of all the British jazz groups drawing a big following to club and concert appearances. Inspired initially by the Art Blakey Jazz Messengers they developed their own swaggering style which coupled with a high level of musical ability made them outstanding entertainment. 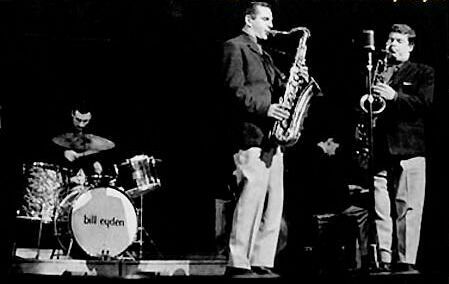 Tubby Hayes writing gave them their own sound and the band generated a swinging sound helped by the explosive drumming of Bill Eyden. Tubby Hayes (tenor sax and vibes), Ronnie Scott (tenor), and Terry Shannon (piano) were ever present. On April 7th, 1957, the Jazz Couriers co-led by Tubby Hayes and Ronnie Scott, with Terry Shannon (piano), Malcolm Cecil (bass) and Bill Eyden (drums) made their debut at the new Flamingo Club in Wardour Street, Soho. This was the opening night of the club's new premises and the Jazz Couriers shared the gig with Tony Kinsey's Quintet featuring Joe Harriott. 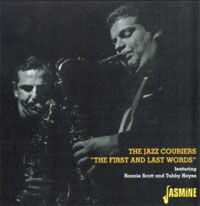 June 8th, 1957 The Jazz Couriers appeared on BBC TV 6.5 Special. This was a forty five minute pop orientated programme and the Couriers probably performed one title. Through The Night Roared The Overland Express*/Royal Ascot*/ On A Misty Night(2 takes)/Cheek To Cheek/Oh My!/Plebus/Reunion/A Foggy Day/The Theme. August 15th, 1957 A second appearance on BBC TV 6.5 Special during which the Couriers probably performed one title. October 3rd, 1957 BBC Light programme - Jazz Club. The programme was shared with the Don Rendell Jazz Six. It was the Jazz Couriers first appearance on a genuine jazz programme. November 19th, 1957 An appearance on BBC TV Jazz Session in a programme that featured Cleo Laine and the Mick Mulligan Band. December 31st, 1957 BBC TV - Tonight. 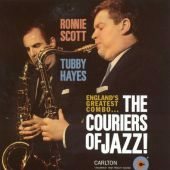 Ronnie Scott and Tubby Hayes were interviewed by Cliff Michelmore. Theme/Stella By Starlight/Guys And Dolls/I Keep Thinking It's Thursday/Plebus/Star Eyes. What Is This Thing Called Love?/Some Of My Best Friends Are Blues/The Serpent/Guys And Dolls/Time Was/Speak Low/Cheek To Cheek. March 27th, 1958 BBC Light programme - Jazz Club. This was a thirty five minute programme and was shared with the Dizzy Reece Quartet. The Jazz Couriers played four titles, (details below), which are available on CD. What Is This Thing Called Love/Love Letters/Some Of My Best Friends Are Blues/the Serpent. Monk Was Here/Last Minute Blues. August 28th, 1958 BBC Light programme - Jazz Club. This programme was shared with the Eddie Thompson Quintet. The Jazz Couriers played five titles, (details below), of which only three (below)are available on CD. Things Ain't What They Used To Be/Oasis/Come Rain Or Come Shine. October 10th, 1958 BBC Light programme - Music in the modern manner. This was a thirty minute late afternoon programme shared with the Alan Clare Trio. Details as to what the Jazz Couriers played are not known. Mirage/After Tea/Stop The World, I Want To Get Off/In Salah/Star Eyes/The Monk/My Funny Valentine/Day In Day Out. January 8th, 1959 BBC Light programme - Jazz Club. This was a fifty minute late evening programme. Three titles are available on CD. These are Squeeze Me, Lifeline and Blues In Trinity (with Dizzy Reece). June 24, 1959 ATV - Disc Break. No details are available. At the time of this last recording the band had no regular bass player so Kenny Napper was drafted in. Bill Eyden had played drums from the start but was contractually bound elsewhere and missed the last two months of the Couriers existence. He was replaced by Phil Seamen. The album, titled The Last Word, contains what was probably the seven most requested arrangements during the band's final months. This record was released in the US on the Jazzland label.. If This Isn't Love/Easy To Love/Whisper Not/Autumn Leaves/ Too Close For Comfort/Yesterdays/Love Walked In. August 13th, 1959 BBC Light programme - Jazz Club. This was a fifty minute late evening programme shared with the Joe Harriott Quintet. No further details are available. The Jazz Couriers played a handful of dates in the last few weeks including the Flamingo Club, which had been their spiritual home from the day they were formed, and a final date on August 30th, 1959 in Cork, Eire. Altogether they had played close to 400 club and concert dates, made four LPs and appeared on radio and TV. The Jazz Couriers were still popular when they decided to split up, the reasons given by the musicians were that they had gone stale and needed a change. Terry Shannon claimed "some of the enthusiasm had gone from the group", Ronnie Scott reckoned that "the British jazz scene is so restricted that we found ourselves going round the same old circle of clubs and one-nighters and a certain amount of the original impetus was lost". Tubby Hayes said "we knew each other's style so well that we were repeating ourselves at times, even though it was often subconsciously". After a great deal of thought and regret they called it a day. "...asked if he could sit in. He scared me to death. In a way Tubby never grew up, underneath it all was the basic thing that he sounded like when he was fifteen. He never had to try too hard - it was there, a natural thing. Tubby always knocked me out...always... with his technical thing and his musicianship. But...there was always a but with me with Tubby. I don't know what you'd call it. It was like you turned a switch and bang, it was always there, a bit - mechanical. I think we just fancied the idea of playing together, so we started the Jazz Couriers. We were both fairly well known, we thought we could work fairly regular, rather than just gigging around with any rhythm section that just happened along. That worked very well for as long as it lasted - about two years. We did the occasional slow tune, but Tubby could really play fast and liked to play fast. That was our big thing. It was terrific - sparked each other off, that sort of thing. This page was last updated during October, 2013.